Global Temperature Report: May 2013 | Watts Up With That? Tropics: +0.11 C (about 0.20 degrees Fahrenheit) above 30-year average for May. Except for Scandinavia & Siberia, latitudes above 60 degrees appear colder than normal. Isn’t CO2 supposed to warm the Arctic & Antarctic more than mid- & low latitudes? And for those interested, I posted the really early preliminary sea surface temperature anomalies for May last week. I checked this morning and there weren’t any major changes in the weekly data. In your first chart, 8 times out of 10 when their was a single spike in Global temperatures other was a sharp fall off in temps. Also I see connection to the economy with manufacturing with spikes and dips in global temps, when manufacturing was at full speed and dips when slowed. The chill over northern Greenland, looping over to Alaska and westernmost Siberia seems significant, as usually most of the arctic is pink and red on these anomalies-maps. It is one reason I’m estimating high, on next fall’s minimum ice-cover. The DMI graph of temperatures above eighty degrees north has been below average for some time, as it heads up to the summer plateau of around 34 degrees (F) at the pole, and looking back at the past years graphs that site offers seems to show such low temperatures are not that common, and are associated with some of the colder years and more severe winters, such as back in the 1970’s. The weak La Nina conditions off Peru don’t offer much hope of warming, although if the La Nina gets stronger we in New Hampshire might luck out, and exist in a locally mild bubble next winter. For some reason it when a warm El Nino first kicks in that we get our worst winters, unless the El Nino is super strong. When was it that Hansen made his speech before congress, on the artificially hot floor (because they left the windows open in June.) ??? In 1987, 1988 and 1989 the temperatures were roughly at the same level they are this June, if not hotter. 26 years, and not a bit of warming. Hansen just looks worse and worse. Clearly, the planet is overheating. I assume this increase is 100% accurate with no possibility of errors involved? Lookling at the globe figure I can’t help thinking that the resolution is worse along the equator and better towards the poles. Any reason for this? And does it have eny implications for the measurments? Anthony, you had a post earlier that March and April were the 2nd coldest beginning to a meteorological spring on the record. In the article you mentioned that #1, 1975 had a warm May, and, if May was cold this year it could take the title of ‘coldest meteorological spring’. Are you able to provide an update? Robert Wykoff, don’t know how old you are, but as a younger teen in the late 70s I can confirm it was cold. Cold. At least here…. we had cold winters with tons of snow and cool summers. Most of my childhood vacations include camping on cold summer nights in British Columbia and Washington State. More than once our street in Calgary was snowed in during the 70s, which has not happened since. Then again, it was the beginning of a new ice age, apparently, although the people who actually remember the hype are now being told there was no such hype by people who either are too young to remember or have an agenda. Old days? Are those before or after I was was born? I remember one cold winter in southern NH when the temperature warmed up some and I went out to check my Taylor Max/Min thermometer on a tree. There wasn’t a breeze, so I felt rather comfortable until I saw it was 12°F (-11°C or so). That year also froze in the Cape Cod Islands, lessee. Ah, this might be about what I had in mind, http://www.csmonitor.com/1981/0116/011642.html is from mid-January 1981. On Monday and Tuesday it took the ferry more than 13 hours to make one leg of the trip, even with a US Coast Guard cutter leading the way. On Wednesday the ferry made it in a mere six hours, completing its first round-trip in several days. The ice, which extends all the way to the mainland, has broken up in recent days. But Coast Guard officials warn that a northerly wind could bunch the ice up between the pincers of this crab-shaped island — and that’s where the harbor is. As more frequent ferry runs are made, they will help to restock the island’s food stores, which earlier in the week were running short of milk and eggs; otherwise food has been plentiful. The partial ice breakup also has helped avert a near-disastrous energy shortage. A barge carrying 425,000 gallons of fuel oil docked here Wednesday night. It was just in time. “We were practically down to nothing” said a relieved Robert Caldwell, president of Harbor Fuel Oil Corporation. An estimated 85 percent of Nantucket residents heat with oil. The rest use either natural gas or wood. I don’t know offhand how often the Atlantic freezes from Nantucket to the mainland, but’s not very often. In January 2013 “North shore beaches were iced over out several hundred yards.” I think most years it doesn’t freeze. The NCDC says the mean minimum temperature in Concord NH for January 1981 was 0.5. Cold! Coldest night -21^deg;F. The year before had a mean minimum of 11.8, but February was colder. Hmm, December was colder too, 80/81 was a cold winter. 2012 was really warm – January had a mean minimum of 16.7°F. Maybe I should look into that period a bit more. Seems the global temp is out of place. Should it not be increasing this time of year on average? Couldn’t be due to pushing a whole bunch of ice in the N Atlantic last year from the equivalent of an Arctic Hurricane, could it? Matt – the opening ceremonies for the 1988 Olympics were held in McMahon stadium – where they had to truck in white sand to make it look like snow, however there was plenty of real snow and cold later on for the Ski jumping events at Canada Olympic park. Think “difference-from-average-temperature-at-this-site-on-this-date” rather than local-temperature-at-this-spot-on-this-date. Here in cityfied Wyoming the forecast high for tomorrow is 55F with a low tomorrow nigh of 41F. June 5, 2013 Feels good, I love it. The data must be wrong because there was no chance the midwest…Illinois, Indiana, Wisconsin etc.had a positive anomaly. It has been a cold spring. And I like how your blog puts it more bluntly then this post: UAH GRAPH SHOWS TEMPERATURES SINKING WORLDWIDE. But, lol, there’s no hope of warming? I thought warming was the enemy, and would be the cause of our ruin… unless we reformed our ways and returned to peaceful stone age style living. Now, with a snowy June over many parts of the globe do we just wish for warmth? No, cold is what we should want, to keep us save from the impending doom that the fear mongering Chicken Littles keep crying wolf about. I was in NE Oregon, where we only hit -35 F, but that was at 1700 feet. Carried my buddy’s little Japanese sports car indoors. You can, but I hope you are not stupid enough to try. @Matt and CodeTech: I was at the 1988 Winter Olympics. Dust was a problem for some events such as the bob sled. There was not a lot of snow on the ground around Calgary at that time. I lived in Lethbridge Alberta in 1966-67 and I remember lots of snow then. In fact my twin brother and I were punished for hiking home from school on the snow mounds created in the middle of the streets from the plows. We had not gone to school the day before because of the snow so had not been informed to not do that, while the rest of the class was. The one and only time in my life I was physically punished at school and it was not justified. I have exclusive pictures that I took of the Jamaican Bob Sled Team, inspecting the run before the event. Also, the only trained hockey players game (no pros allowed until the 1992 games) I ever have seen in my life involved the East Germans and some other team. I haven’t seen a pro hockey game before or since, except on TV. And lastly, around the early 1980’s I was considering moving south, emigrating to the USA because of my considerations for my future family and the advancing glaciers I had been assured were sure to come. The nearest station to me (~50 miles south, 1,000 feet lower) with a report shows 10 days in early May as warm but not record-setting. Otherwise all is pretty “normal.” At the site below the top middle chart is for May. The current week is expected to have night time temps high enough to get tomato set. So no more of this drift to lower temps, please. Whoa – I need to check this more often… lol. I said our street was snowed IN a few times in the 70s, which means there was so much snow you couldn’t get through it. Usually that was a combination of heavy snow and wind drifting it in. This has not happened on that street since then, which doesn’t mean there has been no snow! During the 88 Olympics the bipolar nature of Calgary weather was demonstrated for the world to see. I went to Olympic Plaza every night with my camcorder for the medals ceremony. The first half was COLD, -30C and less with a vicious wind-chill. Some of the events were delayed in hopes of getting better weather. Then a Chinook rolled in, and suddenly it was too warm for some events. I distinctly remember watching Eddy the Eagle jumping and it was something like 20C. If Canada Olympic Park (formerly Paskapoo ski hill) hadn’t been loaded with artificial snow there would have been none. We were sloshing around in slush as it was. Myself, I don’t trust my memory too much. I was born in 1963, and I was a teenager from the late 70s to the early 80s. I realize that childhood memories are not reliable, kids notice things that adults don’t, and miss things that adults worry about. But I do remember (and my parents have confirmed) that the 70s were, generally, a colder time than now. But, according to them, it was also colder than the 50s. This year is not warm, by the way. Just like the last few years, everything seems to be running late. At least in this part of the world, the concept of “warming” is laughable. The UK certainly had a cold spring, and according to the locals in this part of France so did we, they reckon since the 60s rather than the 80s though. You may well be correct . The UAH satellite analysis is very interesting as it is not contaminated by the urban heat affect and it provides a single source view of planetary temperature for all regions. As many are aware, there is correlation of high Northern latitude temperatures and solar magnetic cycle activity for the last 100 years and for the last 11,000 years. As there has been an abrupt change to the solar magnetic cycle it appears we now will be able to determine by observation which portion of the 20th century warming was due to the increase in atmospheric CO2, as opposed to the changes to the solar magnetic cycle. Multiple analyses for different periods indicate that there is a delay in cooling of 11 to 12 years when there is an abrupt change to the solar magnetic cycle. It appears there is some mechanism that inhibits GCR modulation of planetary clouds when there is an abrupt change to the solar magnetic cycle. The following is a comparison of the past solar cycles 21, 22, and 23 to current solar cycle 24. The long temperature series at Svalbard (Longyearbyen) show large variations, and a positive trend since its start in 1912. During this period solar activity has increased, as indicated by shorter solar cycles. The temperature at Svalbard is negatively correlated with the length of the solar cycle. The strongest negative correlation is found with lags 10 to 12 years. … ….These models show that 60 per cent of the annual and winter temperature variations are explained by solar activity. For the spring, summer and fall temperatures autocorrelations in the residuals exists, and additional variables may contribute to the variations. These models can be applied as forecasting models. … ….We predict an annual mean temperature decrease for Svalbard of 3.5 ±2C from solar cycle 23 to solar cycle 24 (2009 to 2020) and a decrease in the winter temperature of ≈6 C. … ….A systematic study by Solheim, Stordahl and Humlum  (called SSH11 in the following) of the correlation between SCL and temperature lags in 11 years intervals, for 16 data sets (William: solar cycles), revealed that the strongest correlation took place 10 to 12 years after the mid-time of a solar cycle, for most of the locations included. In this study the temperature series from Svalbard (Longyearbyen) was included, and a relation between the previous sunspot cycle length (PSCL) and the temperature in the following cycle was determined. This relation was used to predict that the yearly average temperature, which was -4.2 C in sunspot cycle (SC) 23, was estimated to decrease to -7.8 C in SC24, with a 95% confidence interval of -6.0 to -9.6C . SSH11 found that stations in the North Atlantic (Torshavn, Akureyri and Svalbard), had the highest correlations. What is becoming increasingly apparent is that temperatures, over the last few months of ENSO neutral conditions, are running below 2001-02, the last time we had a long run of neutral conditions. I’d be most interested to know whether any long-term comparison of manual/satellite measurements occur in a variety of locations. It’s clearly imperative that, if satellite data becomes the standard used, that it remains accurate and shows congruence with longer-validated measurement technologies. I see no relationship between temperatures and CO2 levels what so ever? The resolution in the tropics is not any worse than at high latitudes…but the temperature variability there is typically weaker. We haven’t really gotten cold enough (on average) for most glaciers to do more than hold their own, let alone grow. One also does have to allow for the fact that the baseline for the anomaly (compared to the historic past) has thumbs on the scales that artificially warmed the present compared to the past — not in the satellite data, but in the ground data. If we had a century of satellite data instead of a bit over 30 years, who knows what it would show? Temperatures might really have been nearly flat since the early 40’s. But anyway yes, in “the old days” — late 60’s — it was colder in upstate NY, at least, where I lived at the time. That was when the coming climate catastrophe was the next ice age, as it appeared that global temperatures had peaked and were falling, and of course humans (pollution) were blamed. About 8 years ago we went to an April wedding in Calgary. It snowed so heavily the reception was cancelled, I spent an hour pushing people out of the church parking lot, and the next day the roads to the east of the city were still closed. I built a snowman on the bride’s deck. 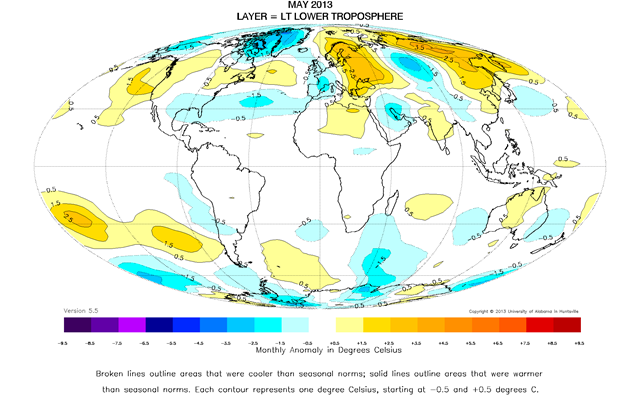 I concluded that dCO2/dt varies ~contemporaneously with Lower Tropospheric (LT) temperature and CO2 lags LT temperature by ~9 months. When I wrote this conclusion I was criticized by both sides of the global warming debate. Initially, this relationship (dCO2/dt varies with T and CO2 lags T by 9 months) was deemed incorrect. As noted below, my “climate heresy” is now gaining some traction. Place your bets, ladies and gentlemen. Faites vos jeux. The above was written ~3 years before Murry Salby’s address to the Sydney Institute in 2011. Whee! We Finns got the biggest +anomaly, the weather has been perfect here for a couple of weeks. The only downside is the constant climate change news reporting. It’s kind of funny when we have had 4 hard and snowy winters and the spring was very cold. But hey, those things were weather, now it’s definitely global warming (tough they fail to mention it that there hasn’t been any for the last 16 years). Drs. Gentry and Spencer, the 14,000 ft/ 600 mb Aqua 06 sensor failed around Mar. 10, 2013. How does its loss effect the current temperature reading? Is there a similar sensor being used as a replacement? Historical climate – an area not sufficiently explored. I was a newspaper boy in the late 40s and early 50s in Winnipeg. When collecting in the evening for the paper in the winter on many very cold nights, my mother used to come with me because she feared for my safety – the route was about 2 miles long, heading out of the city with the last customer a dairy farm – (they used to warm me up with a cup of cocoa before letting me make the trip back home – my mother got one too when she was with me). I used to take my mother to a movie on the walk back to Portage Avenue – so I got to see all those adult black and white movies (25c for my mother and 12c for me -it was only 5c for the kid’s Saturday afternoon “horse operas” my uncle called them – Hoppalong Cassidy, Roy Rogers ….. where the air was about 10% lead as they chased the bandits around the same pile of rocks out in the desert during every episode.). Here in the UK over the last 14 months only 2 of them have been above the average. … As many are aware, there is correlation of high Northern latitude temperatures and solar magnetic cycle activity for the last 100 years and for the last 11,000 years. The long temperature series at Svalbard (Longyearbyen) show large variations, and a positive trend since its start in 1912. During this period solar activity has increased, as indicated by shorter solar cycles. The temperature at Svalbard is negatively correlated with the length of the solar cycle. Thanks for the post William. 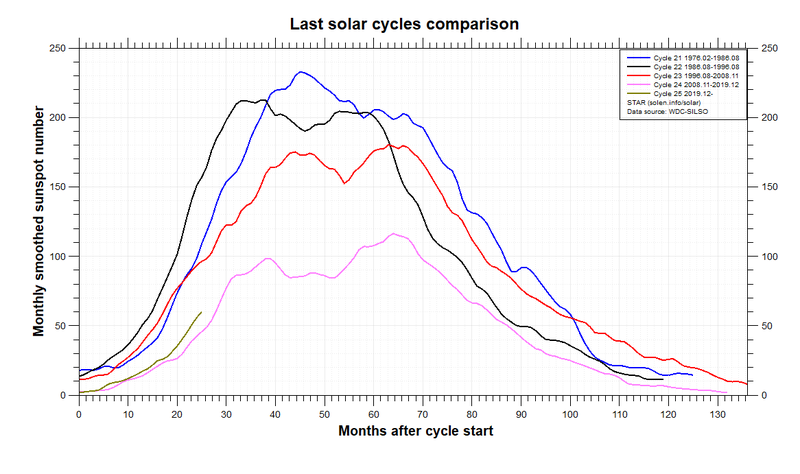 I like the idea to correlate with the lengths of the solar cycle. Will be interesting to watch for the coming years. Another late planting year like 2011. Cold and wet. 2011 turned out to be a record yield, we could sure use another one. Plenty of replanting needed though. Here in Maryland we’ve had a very cool Feb-May. Since I don’t see that reflected on the map above I realize these satellite-based temperature reports are of something completely different then what the earth bound sensors tell us. I’m a little disappointed because I had hopped for something more equivalent. Since this Solar Cycle Peak  has passed, we are now entering years of low Sunspots and low Flux. Since the Global temperature recording started at the “peak” of this 350 year Solar Cycle, we can expect significant rapid cooling. 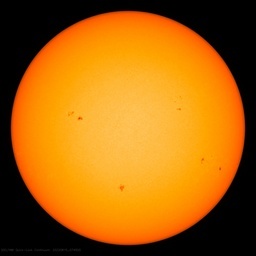 If the Sun goes quiet for 50 years the average global temperature will drop from +0.1C to -1.9C or cooler. Note 1: I use Flux since it is a “mechanical measurement” that is not subject to “human raw data interpolation”. Note 2: The values of warming, neutral, cooling were determined from a simple Sun, Earth model that incorporates a simple technique to deal with the heat storage in the Oceans. The model uses Flux as the input and produces Global temperature for the output. I have a critique of the TSI number. This number is averaged over the planet. This is not the way that Solar energy enters the biosphere. The most energy enters where the Sun is perpendicular to the surface tangent of the Global Sphere. Of course, the least energy enters where the Sun is parallel to the surface tangent. Between these two extremes, there is energy reflection off of the Ozone layer, etc. This means that most of the energy is supplied directly under the Sun. This is between the Tropic of Capricorn and the Tropic of Cancer. Since the TSI is a global average, a small change in the average must have been created by a large change between the “Cancers”. I feel that we need a change in the TSI formulas to remove this “average”, and report intensity directly under the Sun’s perpendicular position.